Frank Russo is Associate Professor of Psychology at Ryerson University and Adjunct Scientist at the Toronto Rehabilitation Institute. After earning his Ph.D. from Queen's University at Kingston, Frank completed Post-Doctoral Fellowships in Music Cognition and Cognitive Hearing Science. He founded the SMART (Science of Music, Auditory Research and Technology) lab at Ryerson in 2006. Projects in the lab tend to be highly multidisciplinary, often incorporating behavioral, computational and electrophysiological methods. Recent projects have investigated sensorimotor interactions involved in vocal-emotional communication, multisensory integration in music, cognitively based music information retrieval, assistive/rehabilitative technology, and the psychology of the urban soundscape. 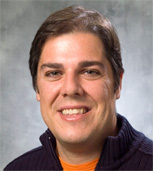 Frank’s lab has published its research in a broad spectrum of journals including Proceedings of the National Academy of Sciences, Psychological Science, Psychonomic Bulletin & Review, Cognition and Emotion, Journal of Experimental Psychology: Human Perception & Performance, and Music Perception. Frank is also committed to the dissemination and translation of research beyond journals via teaching, public speaking, and collaborations with artists, community-based groups, and industry. Successful translations of his research include a Canadian train-horn standard, a sensory substitution technology supporting perception of music by deaf individuals, and a series of exhibitions/concerts featuring music without sound.